The crafting system in STO (unlocked when your character is at level 15) is a great way to get some useful equipment to use as you work your way towards even better equipment. There is also some unique items that you can get such as the Aegis set, Omni-Directional beams, and more. In order to get some of this equipment you'll need to increase your experience in the 6 crafting schools. Let's start with the basic materials. You can get them by scanning anomalies inside missions, completing the team missions in the PvE queue, or doing Duty Officer assignments. The list below shows where you can get them as rewards from particular missions. I'd also like to point out that you will need Duty Officers. If you don't have the required Duty Officer then visit the Exchange and search for the common (white) quality version of that Duty Officer. They usually don't cost a lot of Energy Credits so they'll be good enough until you can get a better quality one. There are also things called Catalysts that you can use. They improve the skill rating and can improve the quality of the item you're creating. 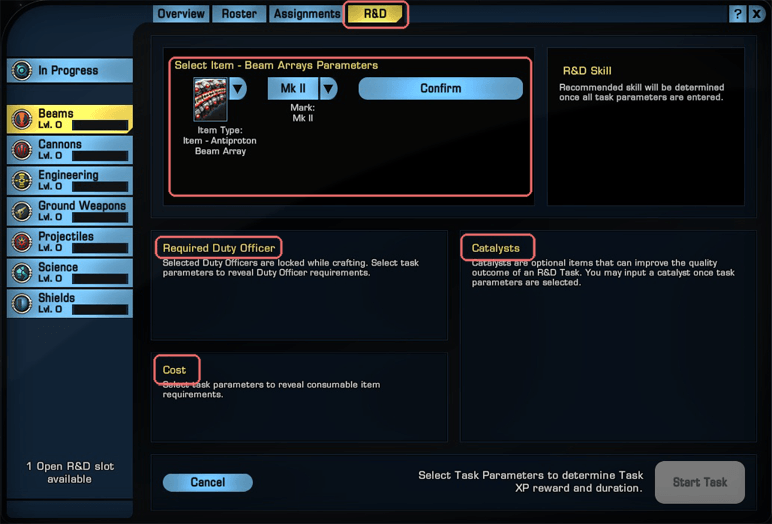 If you're looking for them, there is a chance for them to drop from the "Request R&D Assistance" Duty Officer assignment, as well as from the Research and Development Pack. Catalysts are consumed as soon as you start the crafting process. Another important part are Components. You can craft these using the basic materials and then use them to create the equipment you want such as console, weapons, etc. I'm not going to list all the Components here because you can find them in the list of craft-able items for each school. Before going any further let's quickly go over the crafting window. Everything should make sense to you, now that you have an idea of the basics. Open up the Duty Officer window and click on R&D. The first thing you will see is your crafting slots. More about that in the next section. Under that you'll see the 6 schools I talked about earlier. Go ahead, click on one. You'll be given a list of projects. I'm going to classify these in order to make things easier to explain. Item projects let you construct items for use on your character, ship, officers, etc. Component projects let you create the components needed to build the equipment. Now click on an Item project. At the top you'll be able to choose from a variety of options to craft that piece of equipment. Below that you'll see the list of required duty officers and materials. On the right is the option to add catalysts. Assuming you have everything needed, you'll be able to run this project. You'll also be able to see more information about the item before constructing it. Some items, like the Components, will show you the percentage of success. Lastly, you can speed up the time it takes a project to complete by paying Dilithium. This will instantly finish the project. The amount of Dilithium required will decrease as the time decreases. That's basically it. Not all projects will have the same options but generally this is what you'll see. There are 5 slots you can queue crafting project into. The first is unlocked right away, and you can unlock the other four by completing certain requirements. My approach is to unlock these 5 slots as quickly as possible. The first step is picking a school that you'd like to focus on. If you don't know which school to do pick then just choose the first one. At the bottom of each school's project list is a Research Project that awards 6000 XP. Do this until you reach level 2 and unlock the second slot. Now run the Research Project for the first school and a second one. Getting the first school to level 4 will unlock a third slot. Great! Now you have three slots unlocked and are running three Research Projects. The next goal is to get all three to level 5 because this will unlock the fourth slot. In just a few days you'll have 4 out of the 5 slots unlocked simply by running those Research Projects. At this point you have two options. Continue running Research Projects on all these schools, or continue running the Research Project on your first school while crafting items in the other slots. The reason I suggest continuing the Research Project in the first school is because this one will most likely be the farthest along at this point. Getting it to level 15 will take slightly less time than other schools and it will unlock the 5th slot. This probably a good time to say that the minimum level you should focus on getting all the schools to is 15, even if you do them one at a time. The maximum that can be reached is 20, so if you have the time then you might as well reach for the stars! That's the end of the crafting guide. Enjoy creating and upgrading your items!